From October 25th to the 27th, Japanese Prime Minister Shinzo Abe met with Chinese Premier Xi Jinping in Beijing for bilateral talks during the first stand-alone visit to the Middle Kingdom by a Japanese leader in seven years. The summit covered topics ranging from issues of foreign policy to international security, many in regards to U.S. President Trump’s aggressive actions and economic strategies in the region. Two notable developments which grew out of the summit were Japanese support for China’s ambitious Belt and Road Initiative, a revolutionary program which China created in order to increase economic interconnectedness in the East and Central Asian regions, and the bilateral signing of an agreement calling for the swapping of $30 billion in currency. What is the significance of this? The reason why these two items are issues of contention and attention is due to Japan’s position in the region in relation to the United States and China. To set the stage, Japan has been a U.S. ally since the end of World War II when it saw its economy take off at a blistering pace following reconstruction. The nation rose quickly to not only Asian but global eminence, thus attracting the attention of global powers such as Europe and the United States. Japan has, on the other hand, being an eternal political adversary of China, another reason for the strong U.S. desire to become a Japanese ally. However, while Japan has been a long-time political adversary of the Chinese state, both nations are economically intertwined. And this, this economic relationship between the two foremost Asian powers, is what has caused each side to turn to each other in the face of aggressive U.S. sanctions on the Chinese market. As one commentator put so eloquently, recent Japanese-Sino talks are more of “a halfhearted suspension of a long-term feud” than anything else. To understand just how potentially dangerous the U.S.-Sino “Trade War” is to both the Chinese and the Japanese state, one must look at the economic connections which currently bind the two powerhouses together. 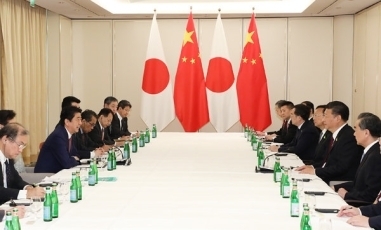 First, the crux of the issue is Japan’s heavy investment in the Chinese economy and the large presence of Japanese business ventures in the Chinese economy. According to Yoichiro Sato of the Nikkei Asian Review, Japan had invested a staggering $113 billion in “hard” and “soft” investments through “the end of 2017.” What’s more, this investment is centered mainly in the Chinese manufacturing industry, meaning that this Japanese capital is firmly locked up in concrete assets rather than “soft” capital such as labor and information, making it much harder to get back in the short run should something dire happen to the Chinese market. 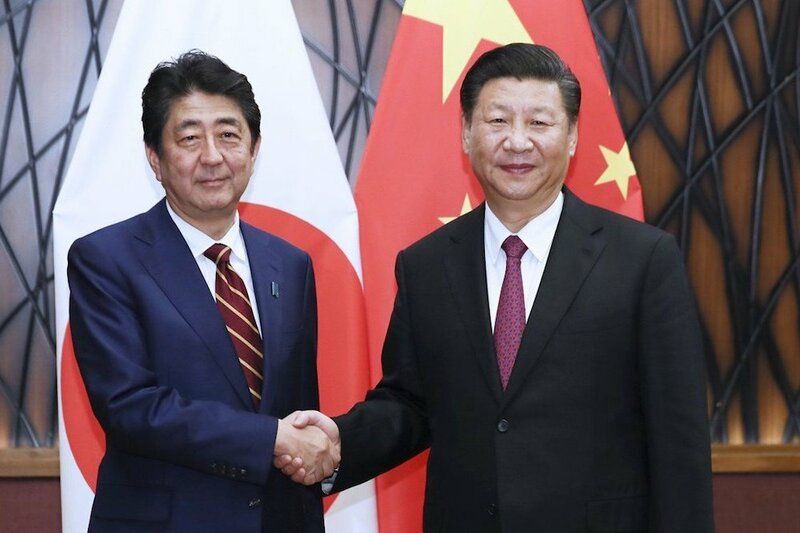 In regards to China’s newly reinvigorated interests in communication and cooperation with Japan, Xi Jinping and his administration understand the importance of Japan’s investment in the Chinese economy. Should they lose this Japanese economic activity, or even see it diminish, shockwaves will be felt, resulting in negative ramifications for Chinese banking interests, industry stability, and possibly the “plunge” of the yuan. Both nations have been conducting substantial trading bilaterally, especially in the financial sector, to ensure shared economic stability. Some of these actions include, as mentioned above, the recent $30 billion (3.4 trillion yen) currency swap and the monumental agreement for the set-up of a $1.8 billion investment trade fund this November. In regards to the latter, the $1.8 billion (200 billion yen) trade fund was established bilaterally by China Investment Corporation and a coalition of Japanese banks, such as “Mitsubishi UFJ Financial Group Inc., Sumitomo Mitsui Financial Group Inc., Mizuho Financial Group Inc. and Daiwa Securities Group Inc.” in an effort to promote trade between Japanese and Chinese industries. These two aforementioned actions are clear statements of economic solidarity between Japan and China and are signals to the United States and the rest of the world of the two nations’ economic prowess. How long this will last is unknown, but this economic entente will certainly continue for the duration of current aggressive U.S. foreign economic policy and, most likely, the current U.S. presidential administration. Though some critics may call the current state of Sino-Japanese economic relations a “cold-thaw” or “politically orchestrated”, one thing is clear: both sides are determined to not only maintain but increase their economic presence in each other’s economy all while expressing a subtle solidarity in the face of clumsily aggressive U.S. foreign economic policy in the region. As it stands now, it seems the Middle Kingdom and the Land of the Rising Sun have been able to set aside their ancient differences for the foreseeable future, putting the United States and the rest of the world on notice.